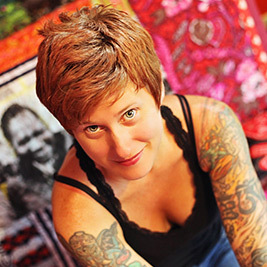 This week's guest post is by none other than Jacey Boggs Faulker, editor of PLY Magazine. 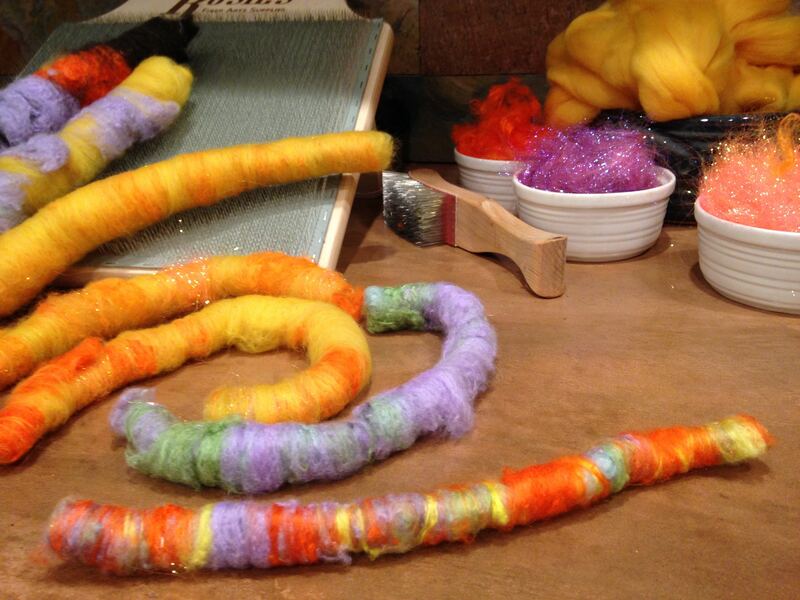 She has spent the last decade falling in love with fiber, writing a book (Spin Art, Interweave, 2012), writing for various fiber and spinning magazines, producing a spinning DVD (Sit & Spin, 2009, self), and teaching all over the world. We are very much looking forward to the PLY Away Retreat happening in Kansas City, MO next Spring, which the Woolery will be sponsoring! We recently sent Jacey our new Rosie Blending Board to try out, and she was good enough to put together her thoughts to share with our blog readers. Enjoy! I learned three things this past week. The first thing I learned is that I hold (or rather, held) the belief that because I’m good at many fibery things, I will have an immediate affinity for all fibery things. This assumption of skill was previously an unexamined and not-too-attractive part of my psyche. It’s been corrected now. The second thing I learned is that I’m not always as good as I think I’m going to be at everything. The third thing I learned is that blending boards are fun, but like all things, they do take time and practice. Let me go back to the beginning. I got a big box-of-beautiful in the mail from one of my favorite places that sends big-boxes-of-beautiful – the Woolery. You know the feeling, right? The anticipation, the excitement, the quick rip of tape, the reverent unwrapping of plastic, and then you see it, your most recent fibery purchase. In my case, it was a Rosie Blending Board, some yellow merino wool, a few packets of sari silk waste, a yellow silk cap, and a bit of sparkle. 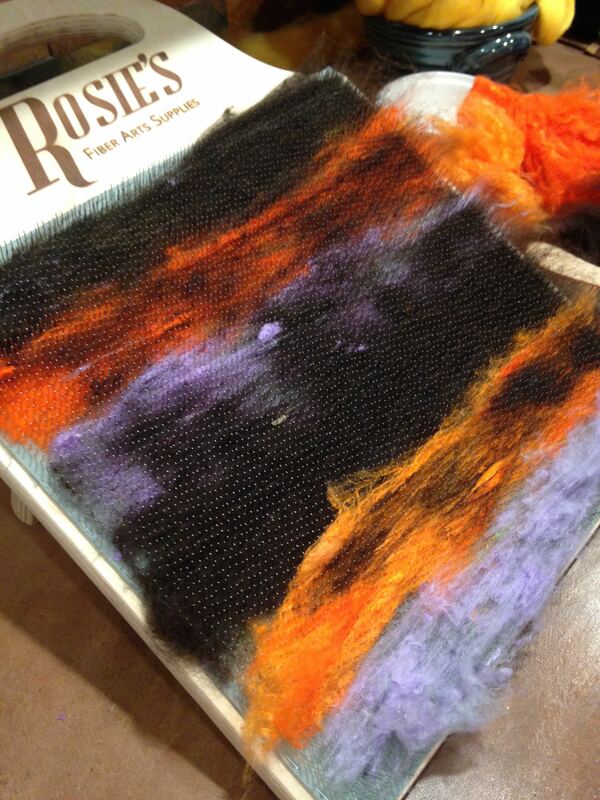 My plan was easy – I would master the blending board and make perfectly blended rolags right off the line. 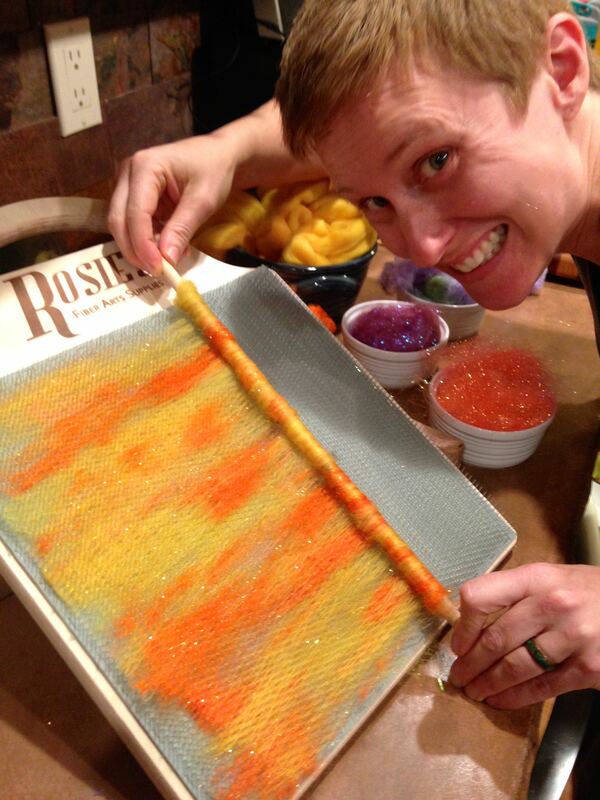 I have seen other fiber lovers use blending boards with laughing faces, unfurrowed brows, and beautiful results. I assumed I’d be just like them. I assumed I’d somehow morph into somebody having Gwen Powell–like blending board talent in no time, blending the perfect ratio of this to that, making stripes, and rolling my perfect rolags off at an angle. I was not, and it was nobody’s fault but my own. 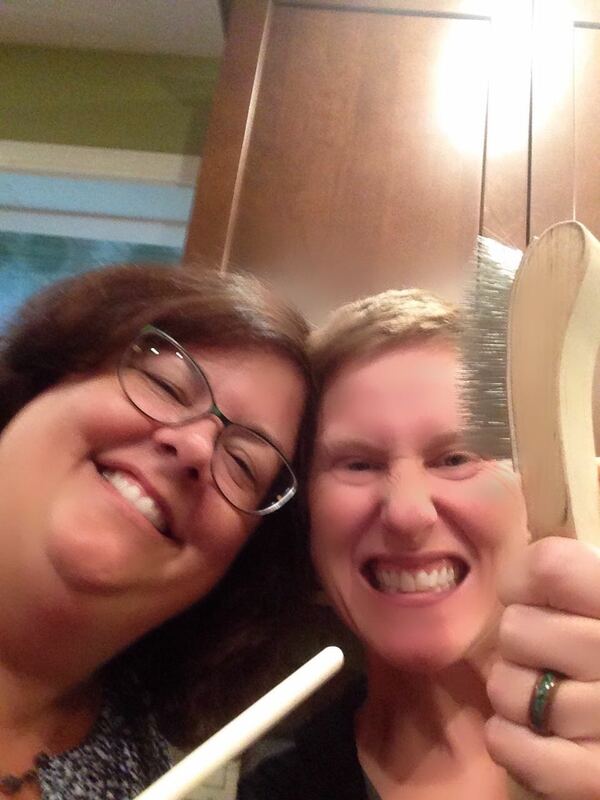 I invited my best fiber friend, Christie, over so I could show her the glory and magic of blending on a board (instead of the handcards she and I have toted to fiber classes or the drum carders that get shuffled back and forth between her house and mine). I set up the station before she arrived. I didn’t even practice because I wanted her to see it all unsullied, fresh, and pristine. I didn’t do any research, read any manuals, or watch any videos. Like I said, I assumed success. I immediately grabbed some fiber, loaded the board to the tips of its tiney teeth, and rolled it off. There, I thought, no problem, that was easy. And after pushing and pulling with all my might, I finally got if off the wooden dowel and held out my first board-blended rolag for Christie to ooh and ahh over. She did not ooh and ahh; she grimaced and then guffawed. 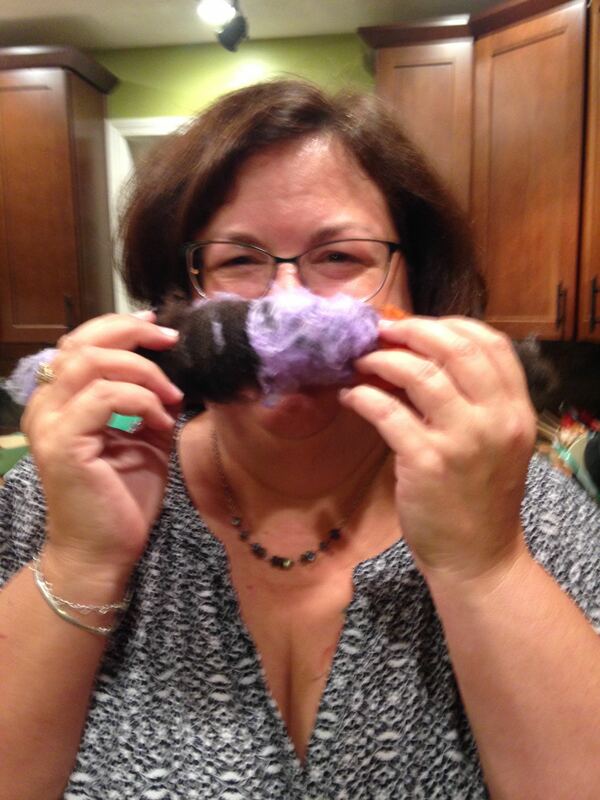 Christie thought it looked like a giant mustache rather than the delicate fiber it was, destined to be spun. I didn’t disagree as we both bent over in peals of laughter. After a few more attempts (I’m embarrassed to say exactly how many), she suggested that maybe I was putting too much fiber on the board. If you’ve ever used a blending board, you probably spotted that problem right away. She also said that I might be wrapping it too tightly around the dowel. Then she whispered that maybe there was a YouTube video that I could watch before I tried again. 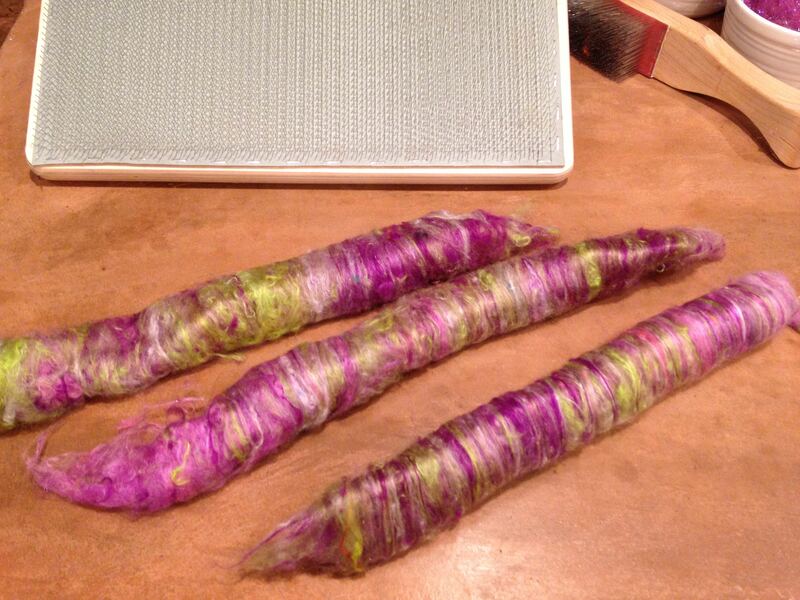 Less fiber and not rolling it as tightly as was humanly possible went well. Perhaps it was because my first few (many) were such a mess, but I was as proud of this rolag as any I’d ever made. I went on to make several that were more and more on the good side of the rolag–giant mustache continuum, and after I did a little research, read a few blogs, and watched a few YouTube videos, I managed a few that I even want to spin. 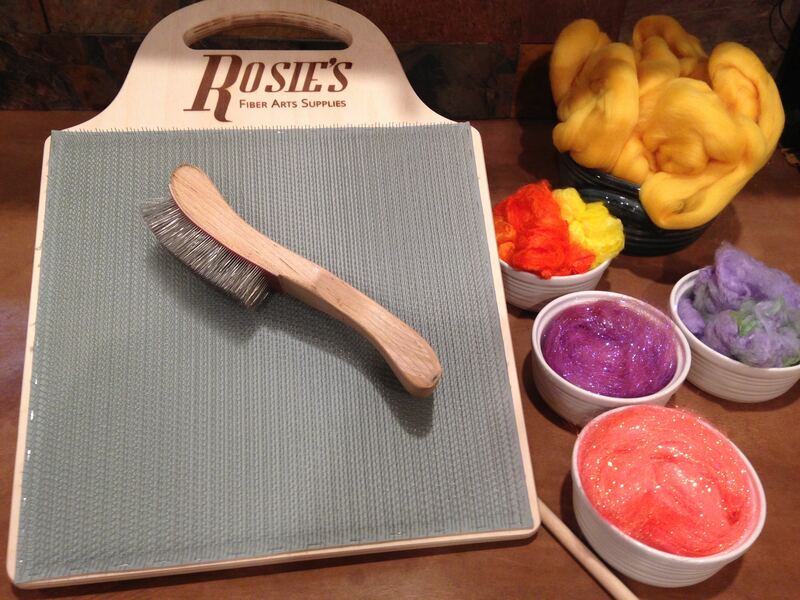 The Rosie can deliver all of these things – it’s super light and portable but also sturdy and comfortable to use. It’s very affordable and, once you understand a few simple things, very easy to use. And finally, the super fine blending brush it comes with is super nice! I couldn’t stop touching it! Don’t use as much fiber as I did. Seriously, my first few rolags weigh in at over an ounce while the latter ones are an eighth of that weight. What was I thinking? Don’t roll the rolags as tightly as possible. When I did this, even the rolags that would have been decent took so much abuse as I pushed, pulled, and screwed them off the dowel that they were a disheveled and misshapen mess. Don’t assume just because you’re a great handcarder or drumcarder, or have skill with any other fiber work, that you’ll immediately make perfect rolags on a blending board. This isn’t the fault of the tool or you; it’s just that it takes a bit to grow and fine-tune a new skill. Read instructions and watch videos. Other people have tons to teach, and we should never forget that we each have tons to learn. As for Christie and me, we’ve got another date with the blending board, and this time, we’re going to be ready!